Somewhere in the wilderness of Baja California in Mexico, the road stretches forever through infinite desert plains. My map indicates a blue lake to the right side of the road, but in reality, a vast dry basin lies naked behind layers of scrubs. I stand beside an isolated restaurant staring upon trees, planted in front of the property, as they bend sideways in the wind. 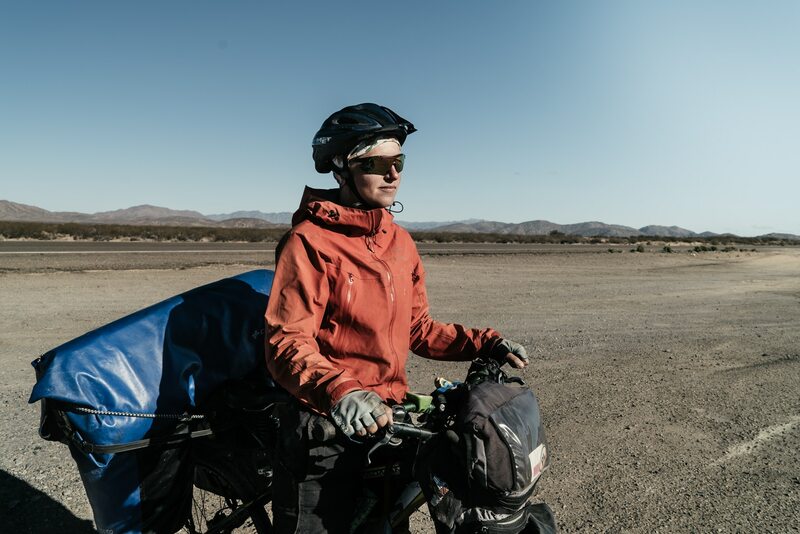 It is after two years since leaving Patagonia that the wind has prevented me from cycling. I now know why all cyclists along the route went from north to south. An hour ticks by, but the bend in the trees remains the same. I take a long look at the blue sky and search for a miracle but all I can see are the floaters in my eyes. The loose particles in my vision resemble tumbleweeds rolling in the desert. I see a lonely speck in the distance which slowly morphs into a recognisable shape as it approaches closer to me. 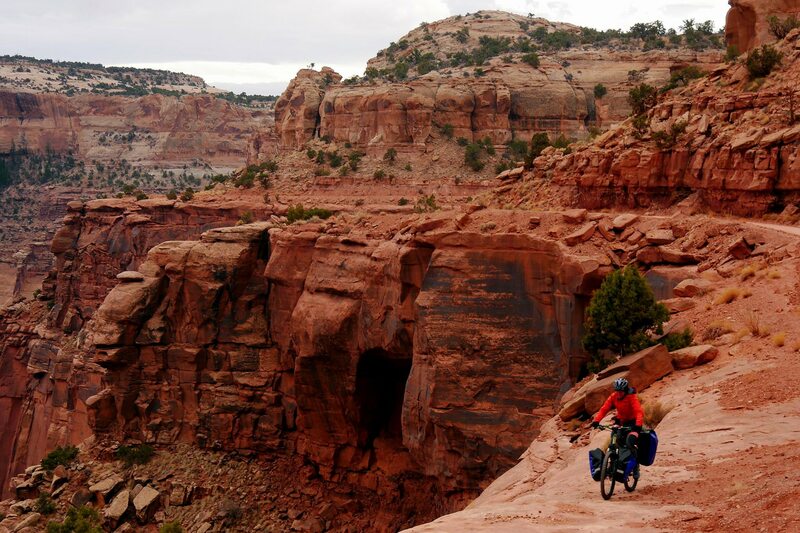 I take a deep breath, press the start button on my Garmin GPS device and begin pushing the bicycle towards the road. I have barely walked a hundred meters when I see a lonely speck in the distance which slowly morphs into a recognisable shape as it approaches closer to me. 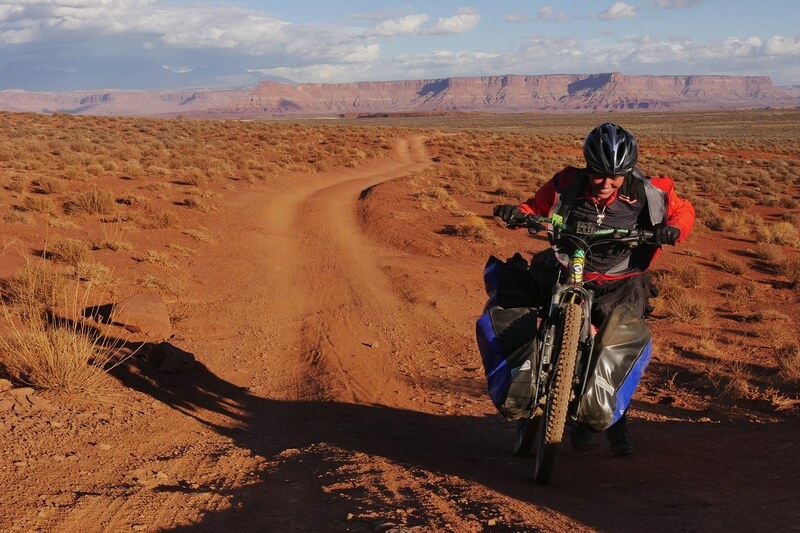 A touring cyclist emerges from the road who keeps the pace as if wanting to continue, but then slows down and steers the bicycle off the road in my direction. Before I can guess the nationality of the rider, I notice a sticker with white and red horizontal stripes on the handlebar bag and another sticker with letters PL on it. “Hello, I am Maria. I am from Poland.” She extends her hand to me. At the end of the trip, one of them found a boyfriend, got married, and decided to stay in Alaska, while the other bought a flight ticket and returned to Poland. “Are you going to Ushuaia?” I ask her. “Umm, maybe!” A warm smile rises on her face which is facing towards the sun. In her light-blue eyes, the sun appears like a fire in the cold winter evening. 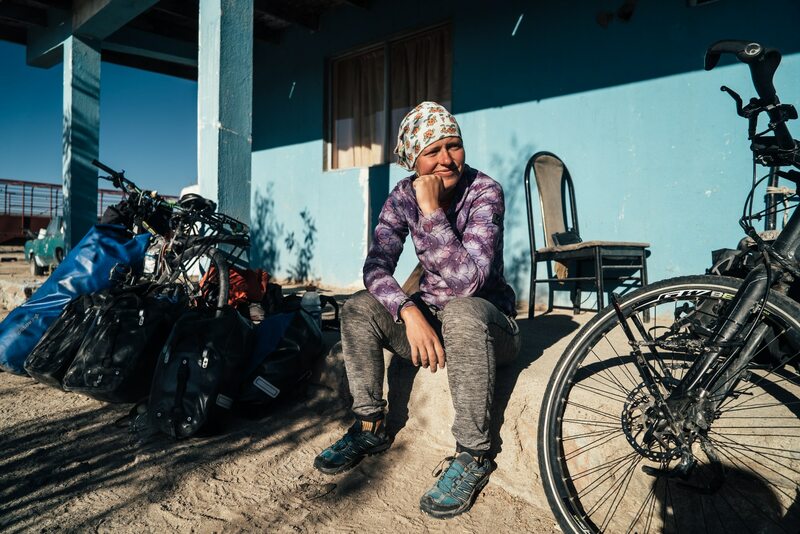 Maria Garus is the first solo female cyclist I have met in 18 months. She started off her journey eight months ago with her two Polish female friends. They all flew into Alaska with a goal to bike together for two weeks from Anchorage to Coldfoot. At the end of the trip, one of them found a boyfriend, got married, and decided to stay in Alaska, while the other bought a flight ticket and returned to Poland. 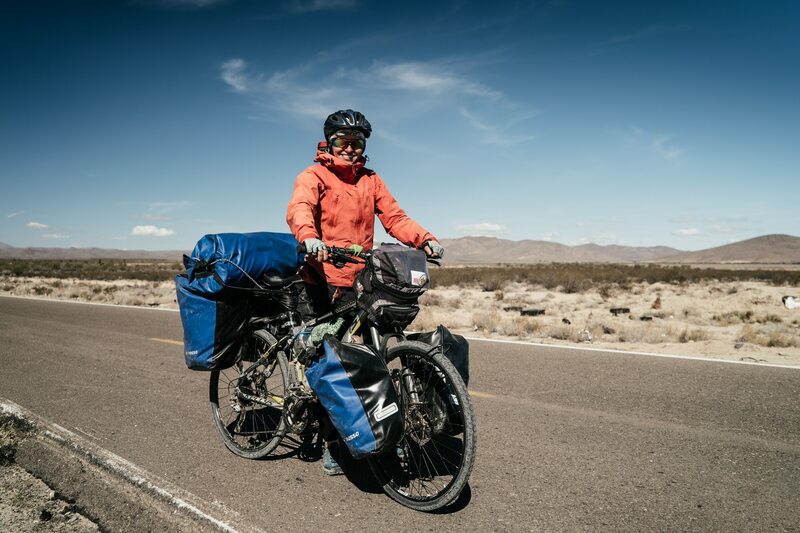 Maria’s bicycle is loaded with four fully packed panniers and a huge trunk bag. It is a lot of gear to carry for a woman like her. “What is inside them?” I point at her blue panniers. “Probably!” she replies with a smile. We talk for over an hour next to our bicycles. Once in a while, I take a glance at the position of the sun in the sky. “Do you want to leave?” Maria asks me. I look at my wristwatch. It is 2:30 pm. The GPS device shows a distance of 120-m, the shortest ride I have ever done. I nod to her. We scout for a suitable location and decide to pitch the tents behind the same restaurant where I was waiting a while ago. Cold wind pierces my skin. I have only two layers on, a long-sleeve cycling shirt and a light rain jacket. “Do you want to wear this?” Maria hands me her down jacket. I give it a try but the sleeves are a couple of inches shorter and I am barely able to close the zippers. We walk into the restaurant and sit around a table. Maria orders a beef soup and I, a vegetarian omelette. While eating, we agree that the fresh tortillas from the restaurant are delicious. They are soft and buttery with many layers, similar in taste and texture to thin Parathas. We order some more. “Why did you choose the travel over the job?” I ask her. 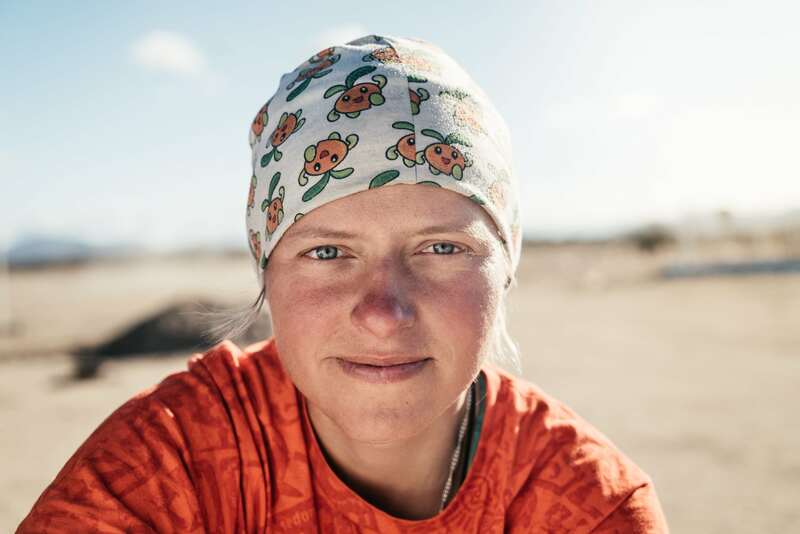 Maria adjusts the bandana on her head which has smiley orange faces printed on it. She is 33 but barely looks 23. Her smile is gentle and her persona, humble, but there is a burning determination in her eyes which only comes after enduring hardships on the road. I am curious to know what scares her the most? “Two weeks ago, I ran away from the bed, haha. I have many shame stories to tell, but I better not! ” she giggles, her cheeks blushing. “Really?” my eyes widen in surprise. We lose track of time while talking. Hours and hours pass by. People come and leave the restaurant. “Sorry, we have to close now!” the lady in the restaurant tells us. It is 11 pm, but the night has just begun for us. We leave the restaurant to face the freezing cold. It is pitch black outside. We sit on the chairs in the covered passage outside a building. I grab the sleeping bag from my tent and spread it over our legs and use the sleeping bag liner to wrap around my head. “At this moment, you look like an old Polish woman from a village, haha” Maria laughs at me. We both marvel in quietness at the sky which is full of stars. “What was the most amazing place you have visited?” I break the silence. We live through each other’s experiences under the rotating sky. At 2:00 am, we call it a night and crawl into tents. It is the coldest night I have spent in about one and half years. In the morning, the sun shines and brings warmth to our camps. We head to the restaurant for a breakfast. “Do you know how long can I stay in Mexico?” Maria asks me. “Six months! It should be mentioned on the tourist card you get at the border!” I tell her. “Well, if they going to put me in jail because of this I will have another story to tell,” she laughs. Maria is a risk-taker, but I advise her to stay clean and check with the authorities in the next town. “What’s next after this trip?” I ask her. I look at the watch. It is already half past noon. How can time fly so fast? We come out of the restaurant and get ready to leave. I rummage through my bags and find a red silicone wristband. I take her right hand and put on the gel bracelet bearing the imprint “Born to be wild” around her wrist. Certainly, there can be no better to describe her than this. Now she has two bracelets around her wrist. She immediately takes off the other one. 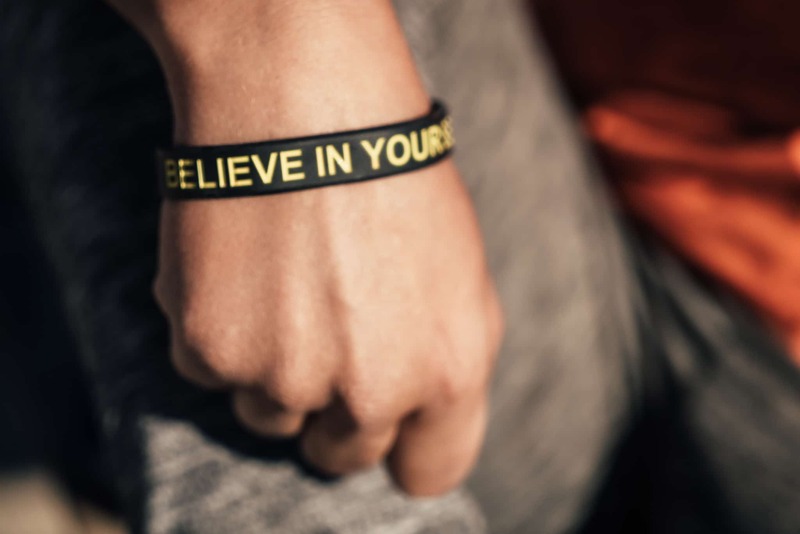 The black wristband has “Believe in yourself” inscribed on it in yellow colour. I wear it around my wrist and we both drag our bicycles to the road. “Are you going to the Cocos Corner?” she asks me. There is nothing except one long black line in the desert. It is the same road, but a different journey for each of us. We arrive at the tarmac and look at each other. Our time together is over. Yesterday, we shook hands like strangers, but today we hug each other like old friends. When our bikes roll I find myself riding side by side with Maria. I am going in the opposite direction. I stop pedalling but my bicycle keeps rolling for a while as I watch her go away. With the wind on her back, she flies down the Highway-1. Her image floats above the road, then gradually sinks and disappears. I turn around and ride slow. I am not sure if I am going against the wind or the will. After half a kilometre, I stop for a second at a turn-off and look behind. There is nothing except one long black line in the desert. It is the same road, but a different journey for each of us. I put in the earbuds and turn up the volume. The Sweet Lullaby song from Deep Forest hits my ears and I start pedalling towards Cocos Corner. I cannot wait to hear what Coco has to say about Maria! 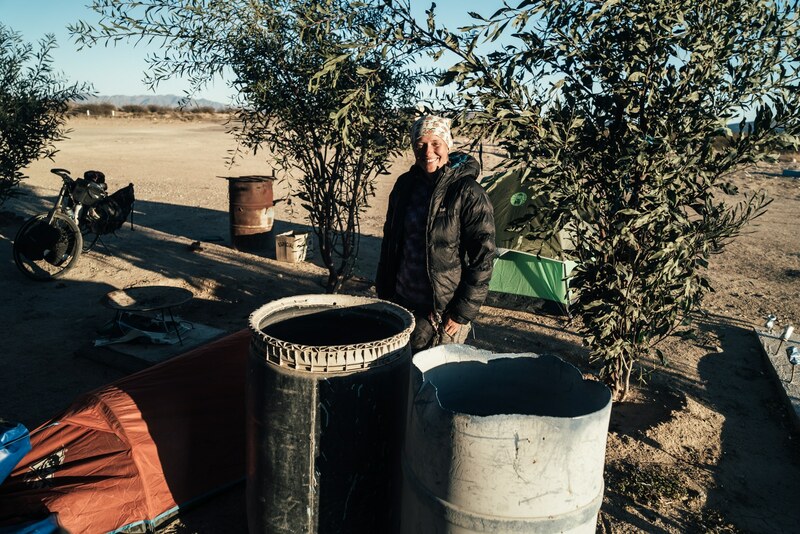 During our recent conversation, Maria told me that her tent was damaged by coyotes while she was camping in the desert. I have launched a crowdfunding campaign to buy her a new tent. Please support her. As I mentioned earlier your writing has gradually become so sweet and flowing. I am not an outdoor type so I would not be able to appreciate your full experiences but I do know you have touched the souls of so many people that this in itself gives you immense pleasure and satisfaction and what is there in life if not this experience. 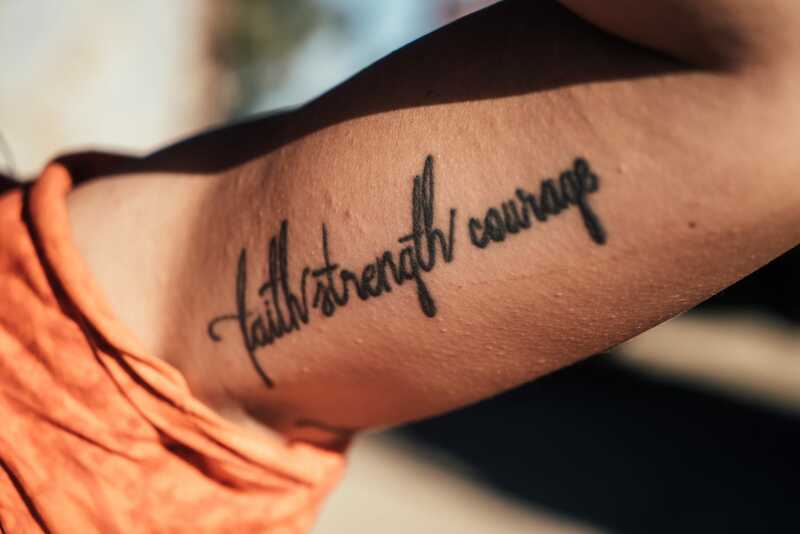 Maria and you are both icons of adventure, faith and courage. God bless you always and may you reach your destination with fully glory. Thanks for encouraging a novice writer like me! I come back after a long time. The changes you have made in your blog and the stories that you have put here are really interesting. I just went through Maria’s story. I am great admirer of your writing style. Your book later will be among the top travelogues in the world. Especially when it will be available in Urdu too. I continue to follow your journey with much interest on your Blog, best wishes for your continued journey.